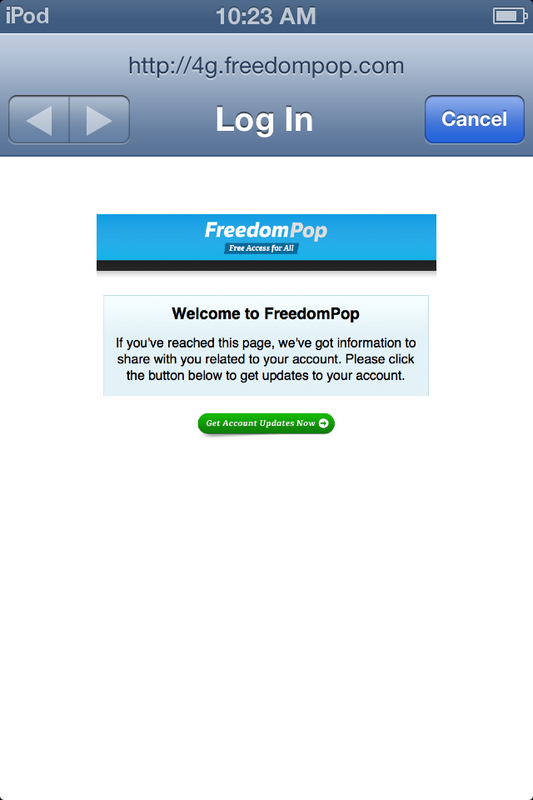 When I click the button it takes me to http://setup.4g.freedompop.com, but it never loads so I cannot get on the wifi. Have you ever seen this screen and do you know if there is a way to turn it off? Thanks, I attached a screenshot. did we come up with a work around? What is your MAC Address? That mac address was for the sleeve, I assumed you needed that one and not the iPods. not sure if ali will be around anytime soon...Do you remember if we found a work around for this...I thought we did, but I can't seem to find it in my notes? The only cure I see results is when an admin fixes that persons account data on their servers. Then blammo! Everything's good ! There has been an epidemic of this in recent couple of weeks. I've started discussions on getting all admins keep this error in mind when solving all kinds of "no internet" complaints. I believe a number of the month long threads of us helping and getting nowhere are possibly centered around this one error. My "new" 3rd Photon arrived with this disease. Two other times I froze one account and got suspended on the other. When 'cleared', they were left infected. Each solve, an admin was able fix complete in short order. Thanks for the info....I just thought I seen you come up with a fix. I have the same problem, please help, thanks. @Zeki Gokce‌ did you get it resolved ? When i click on it, it redirects, times out, and then just informs me i need to contact customer support. I cannot connect to the internet. My Modem's MAC address is 00:1D:88:4C:FC:4E. I also got this problem more than two months and the support never fix my problem! I've got this problem right now on my MiFi 2. No internet connection, redirects me to the Service Error page, and the "Get Account Updates Now" button doesn't work. Can you please fix? edit: thanks, it's working again.